SInce it’s cyber Monday I figured I give you two for one on recipes. The 2 will be BBQ mini meatloaf and a baked Turkey. The mini meatloafs I found while only having one arm. 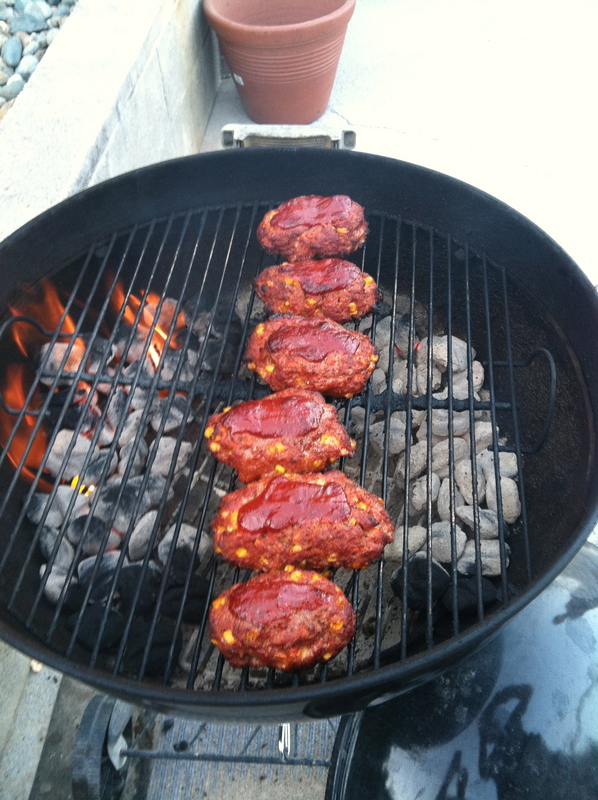 Check out my BBQ meatloaf recipe for all the ingredents. I was craving meatloaf and while mixing it I was throwing the mixture in the air and catching it to mix the mixture. When I throw the ball down it turn into a football shape and then it came to me mini meatloaf. The best part about mini meatloafs is it takes about 30 minutes to cook instead of 1 hour. Now for the baked turkey. I know what your thinking why baked and not barbecued. Its really easy to answer the turkey was to big for the bbq. I guess its time for a new bbq. I started by cleaning the turkey in the kitchen sink. When I was finished cleaning the 21 pound bird I left it in the sink add salt to the top of the bird and rub it in. I also rubbed the inside of the bird with salt. I then add Santa Maria seasoning from the Wagon Wheel. Then I cover the top of the bird with ice and cover the sink and bird with siren wrap. I left the bird in the seasoned water for 8 1/2 hours. This process is called brining. After the turkey had brined for 8 1/2 hours I drained the water, rinsed the turkey, and patted the turkey dry with paper towels. Now this part is were the turkey gets fun. I then chopped up 2 small onions in a chopper along with celery and carrots. I then added the chopped veggies to a frying pan that had a half a stick of butter in it. i didn’t like the look of the veggie mix so I added a whole stick of butter to the frying pan. While all of this is going on I have been pre heating the oven at 350 degrees. 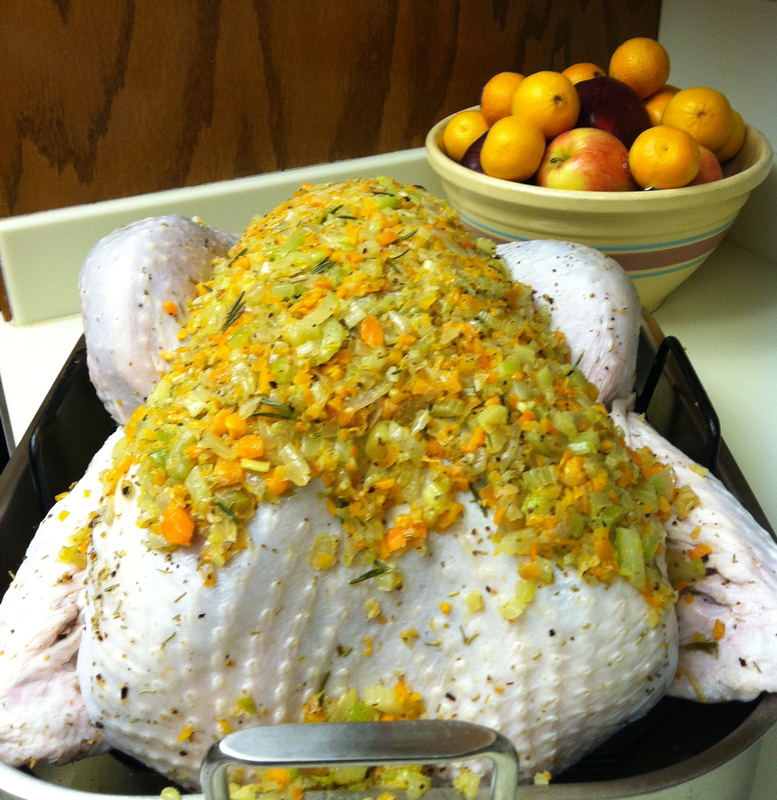 I then placed the veggie mixture all over the top of the turkey. I also rubbed butter where the mix had not covered the turkey. I placed the turkey in a big roasting pan with 2 cans of chicken broth. I then covered the whole turkey with tin foil so the turkey wouldn’t burn. 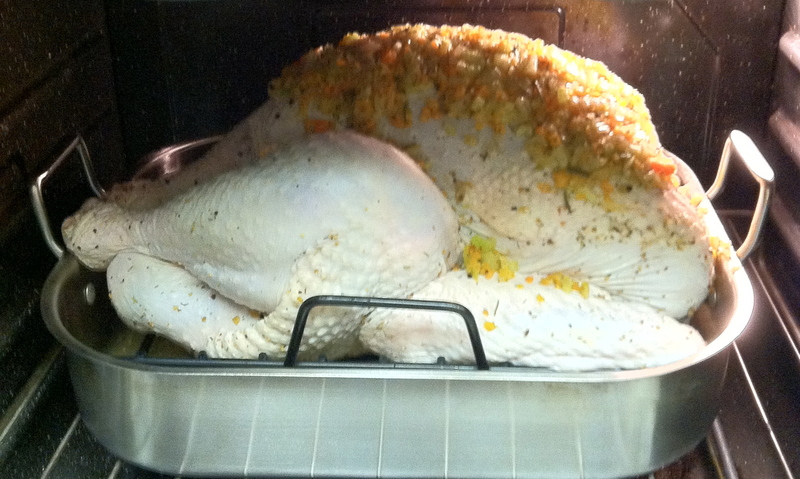 I removed the tin foil after 6 hours and placed the bird back in the oven for anther hour and a half. 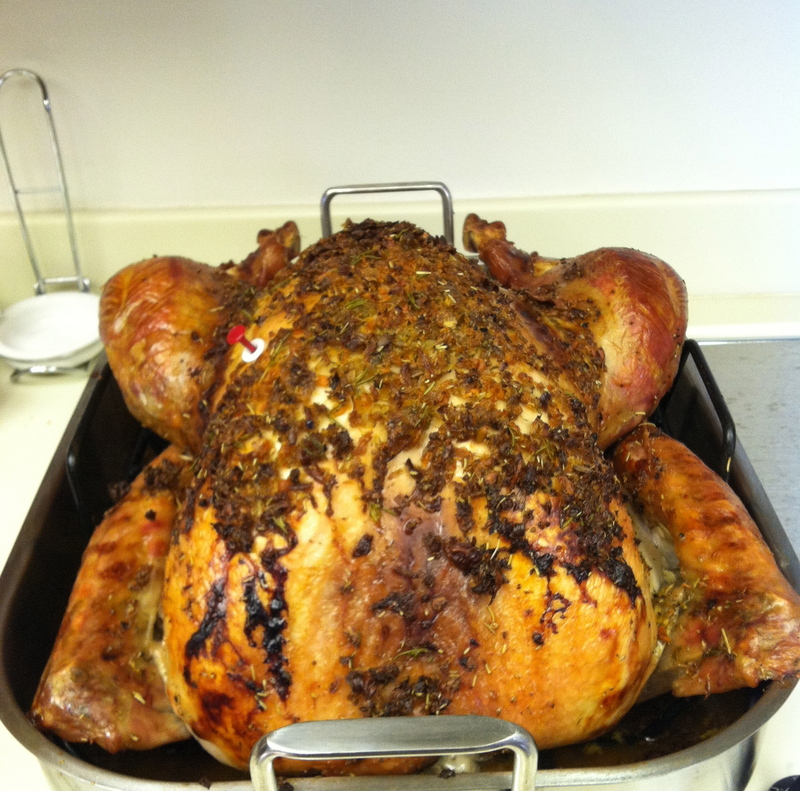 I know you well love this moist full flavored turkey all of my family does.